The solar wind is a constant flow of charged protons and electrons flowing outward from the Sun. They can reach a velocity of 400 km per second. These particles escape the gravity of the Sun because they have too much energy. The Solar wind has many effects in the Solar System, notably producing tails on comets and aurorae at the poles of certain planets. The Sun also produces intense solar flares, or 'coronal mass ejection' - CME, on occasion. These are violent outbursts of particles that blast away from the sun in any particular direction. It is more likely we experience the effects on Earth when these occur. Scientists are able to predict if any of these are directed to Earth by satellites that constantly study the 'weather' of the Sun and are able to warn of such events at least 24 hours before they may hit Earth. The solar wind is theorized by some astronomers to be responsible for thinning the atmosphere of Mars by deflecting atmospheric particles in its upper atmosphere. Mars has no magnetosphere to protect it. 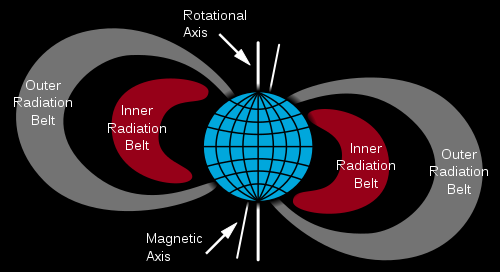 Imagine the Earth as a magnet, producing a magnetic field surrounding it. This is caused by Earth’s large iron core and the rotation of the Earth. The Earth creates a field called the Magnetosphere. This extends in the direction of the Sun but much further in the opposite direction, even further than the distance to the Moon. It deflects the damaging effects of the solar wind. 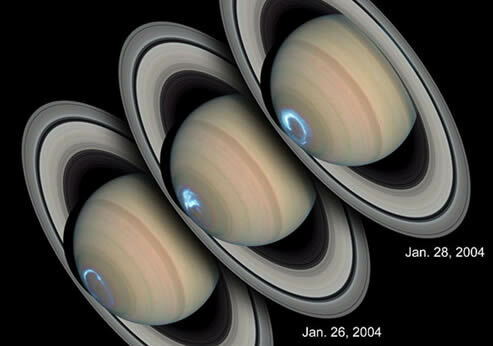 Aurorae are also seen on Jupiter and Saturn. 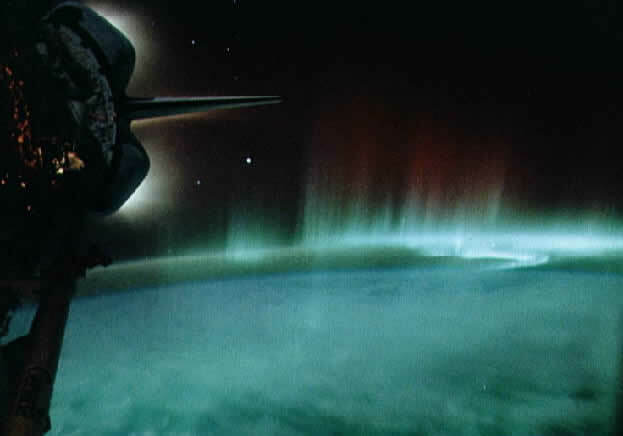 The particles that get caught in the Van Allen Belts caused by the Magnetosphere then move along these field lines toward the magnetic north and south poles and observers in these location witness aurorae. These are spectacular displays of light and colour in the sky. 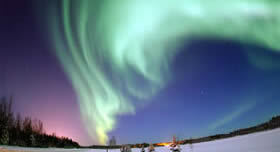 In the northern hemisphere this is called Aurorae Borealis. 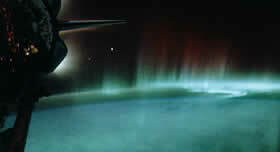 In the southern hemisphere this is Aurora Australis. The intensity of the aurorae depends on the ferocity of the solar wind which in turn depends on the level of solar activity. As comets move nearer the sun the sun's radiation is responsible for heating a comet and the solar wind particles will interact with the comet and form a tail which points away from the Sun. This is the effect of an increase of plasma hitting the magnetic field of Earth after a violent CME. It was hypothesised in the 1800's. In 1859 telegraph systems showed an increase in voltage and observatories recorded a dramatic increase in sunspot activity. 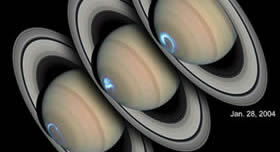 This was accompanied by aurorae that could be seen at lower latitudes of the northern hemisphere. This was known as the Carrington Event. In 1989 a similar event caused by increases of geomagnetic electrical lead to electricity breakages throughout Northern America. Satellites are vulnerable, not just to direct damage but the increased wind on Earth's atmosphere actually can heat up the upper atmosphere and affect satellites delicate orbits. GPS and navigational systems are especially at risk to solar disruption meaning huge problems on users swho rely on them. An upper layer of Earth's atmosphere called the ionosphere is used by radio signals and these are particularly affected by solar activity. This makes the essential radio communication of aircraft difficult. A potential issue is the effect on flight crews health if traveling at high altitude during an eruption. High energy particles can cause radiation poisoning, astronauts are especially vulnerable. Those working on the ISS are advised to move to a shielded area on the station. It is important to remember the Earth's atmosphere protects us while we are on the surface, only some technologies are vulnerable. 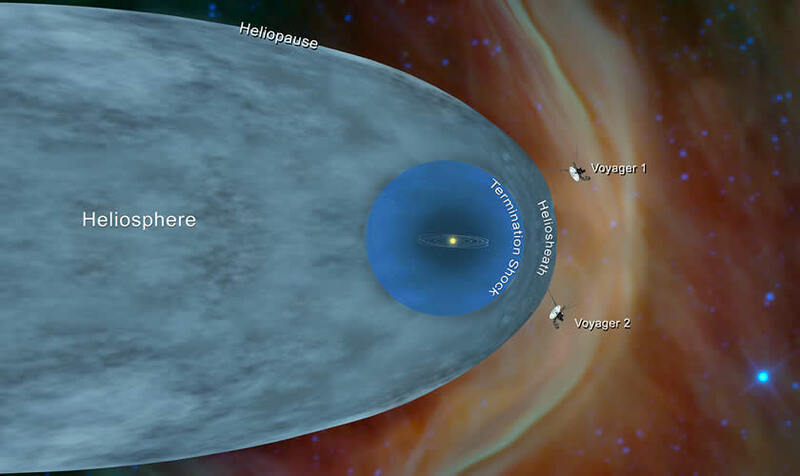 The Heliosphere is a 'bubble' surrounding the solar system, created by the solar wind. It is thought to be 'cigar-shaped' as it is shaped by the Sun's movement. The Sun is moving at a speed of 700,000 km as it orbits the galactic centre. It is thought to be between 80 and 100 AU distance to the Sun. Explain the influence of the solar wind on Planet Earth. 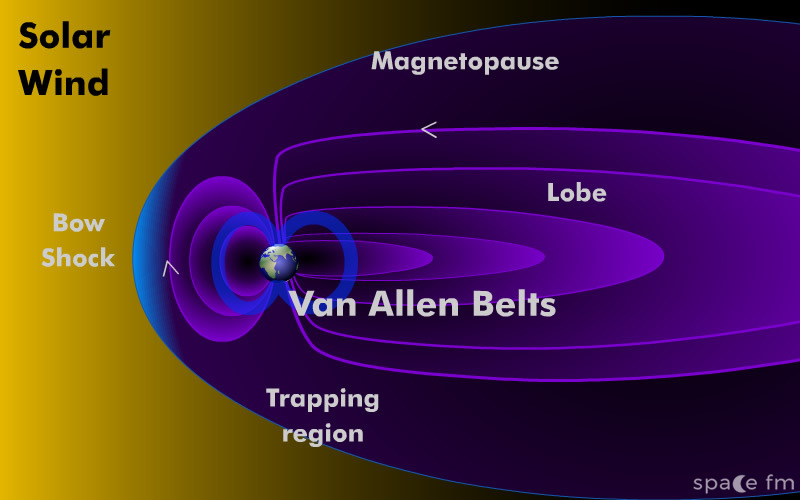 Explain the influence of the solar wind on the Van Allen Belts. Where on Earth are Aurorae most likely to be seen? 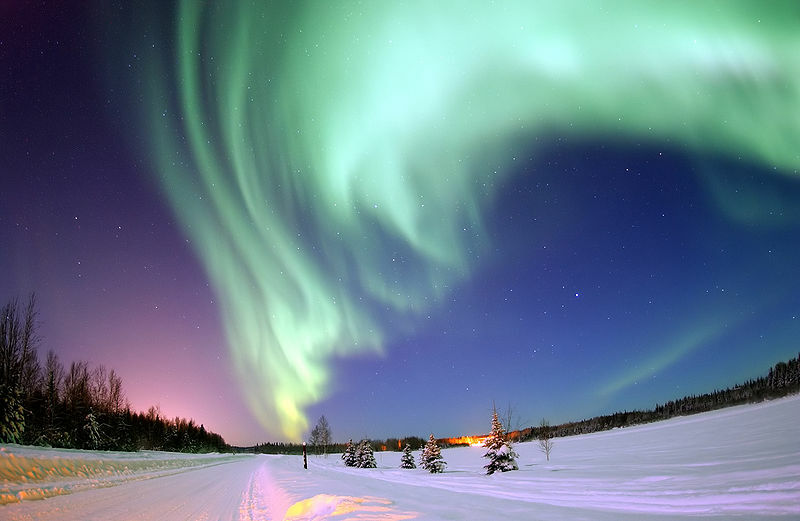 The interaction of the solar wind on Earth's magnetic field causes aurorae at northern and southern latitudes. The Sun is classed as an ordinary G2 medium sized yellow dwarf star.